When I heard about this, my blood began to boil. I simply don’t believe in publicly humiliating children. It’s tricky to dole out treats when we waste time trying to figure out who’s worthy, and who’s too fat. And then I started thinking about how I might be more like the No Candy Letter lady than I thought. How many times have I made assumptions about someone based on outward appearance? How often do I make sure that only I give the “treats” with which I’ve been entrusted…my knowledge, my time, my energy and resources…to those who I deem worthy? When did I last I go out of my comfort zone to invite people into our home, our church, our lives? How many times have I spoken about something that was none of my business, just because I believed that I had all the answers? Which of my neighbors or acquaintances might need my help, rather than my judgment or my opinion? Whose behavior have I dismissed as annoying…or pathological…when it’s a cry for attention, or support, or acceptance? That lady said she’s disappointed in her village. I’m disappointed in me. Who can see the Light of the World when it’s being blocked by layers of No Candy Letters? Instead of judging, I could try listening. Instead of scoffing, I could offer a tissue. Or a casserole. Or a hug. Rather than making assumptions, I could build a relationship, and find out the whole story…and learn how I can help. 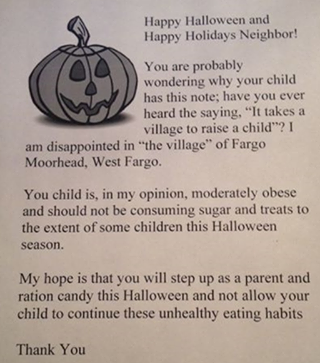 Instead of a No Candy Letter, I can generously dole out sweets on Halloween…and organize a hike or a game of kickball or an afternoon of jumping in the leaves…and invite my neighbors to share a meal. From now on, I won’t be wasting time deciding who is good enough. I’ll be too busy loving my neighbors. This entry was posted in Reaching Out, Working Together and tagged Fargo letter, holidays, hospitality, outreach, special needs by katiewetherbee. Bookmark the permalink. Love this, Katie. Thanks for a reminder all of us No Candy ladies need now and then! Ummm… I agree! You go girl! I’ll take a casserole, please! Love you, Katie!